Michael Clarke has paid tribute to Phillip Hughes. The full text of Michael Clarke's beautiful tribute to his friend Phillip Hughes. 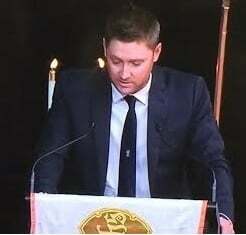 Australian cricket Michael Clarke delivered an emotional speech this afternoon at the funeral of his friend Phillip Hughes. He’ll definitely be calling me a sook right now, that’s for sure. I’m deeply honoured to have been asked by Phillip’s family to speak today. I’m humbled to be in the presence of you, his family, his friends and his community. He was so proud of Macksville and it’s easy to see why today. Taken from the game, his family and loved ones at the age of just 25, he left the mark on our game that needs no embellishment. I don’t know about you, but I keep looking for him. I know it’s crazy but I expect any minute to take a call from him. Or to see his face pop around the corner. 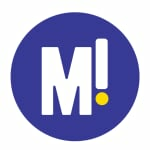 Is this what we call the spirit? If so, then his spirit is still with me and I hope it never leaves. I walked in the middle of the SCG on Thursday night. Those same blades of grass beneath my feet where he and I and so many of his mates here today have built partnerships, taken chances and lived out the dreams we painted in our heads as boys. The same stands where the crowds rose to their feet to cheer him on and that same fence he sent the ball to time and time again. And it’s now forever the place where he fell. I stood there at the wicket I kneeled down and touched the grass, I swear he was with me. Picking me up off my feet to check if I was OK, telling me we just needed to dig in and get through to tea. Telling me off for that loose shot I played, chatting about what movie we might watch that night and then passing on a useless fact about cows. And I could see him swagger back to the other end, grinning at the bowler and call me through for a run with a booming voice. The heart of the man that lived his life for this wonderful game we played and whose soul enriched not just our sport but all of our lives. Is this what indigenous Australians believe in person’s spirit being connected to the land on what they walk? If so I know they are right about the SCG. His spirit has touched it and it will forever be a sacred ground for me. I can feel his presence there and I can see how he has touched so many people around the world. The tributes to him from cricket lovers kept me going. The photos, the words, the prayers and the sense of communion in this loss from people across the globe have shown me his spirit is in action. It has sustained me and overwhelmed me in equal measure and the love of my band of baggy green gold brothers and sisters have held me upright when I thought I could not proceed. Is this what we call the spirit of cricket? From the little girl in Karachi holding a candlelight tribute to masters of the game like Tendulkar, Warne and Lara showing their grief to the world, the spirit of cricket binds us all together. We feel it in the thrill of a cover drive or the taking of a screamer at gully, whether by a 20-year-old boy in Worcestor or Brendan McCallum in Dubai. Just as significant to the players in a western suburb club game as it is in a Test match. The bonds leading to cricketers around the world putting their bats out, who saw people who didn’t know Phillip lay flowers at the gates of Lords and every cricketing nation on Earth to make its tribute. Players old and new rushed to his bedside where from wherever they heard the news to say their prayers and farewells. This is what makes our game the greatest game in the world. Phillip’s spirit, which is now part of our game forever, will act as a custodian of the sport we all love. We must listen to it, we must cherish it, we must learn from it, we must dig in ... We must dig in and get through to tea. And we must play on. So rest in peace, my little brother, I’ll see you out in the middle. Phillip Hughes&apos; funeral. Photo: Twitter. Phillip Hughes&apos; funeral. Screenshot via ABC. Hughes&apos; cousin, Nino Ramunno. Screenshot via ABC News. Jason Hughes speaks at his brother Phillip Hughes&apos; funeral. Screenshot via ABC. Phillip&apos;s little sister Megan speaks at Phillip Hughes&apos; funeral. Screenshot via ABC. 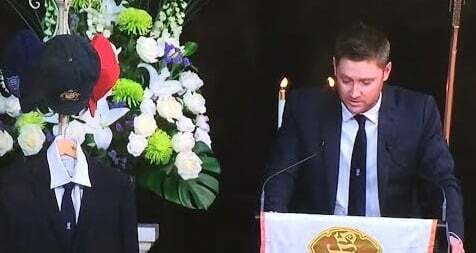 Michael Clarke speaks at Phillip Hughes&apos; funeral. Screenshot via ABC. Pallbearers at Phillip Hughes&apos; funeral. Screenshot via ABC. Phillip Hughes’ funeral: live coverage. Phillip Hughes was very much a man, but today he could have been anybody’s boy.